Last week, EPA issued a press release announcing a Federal Register Notice seeking public comment on whether EPA should consider public health risks from vapor intrusion as a factor in eligibility for the Superfund cleanup program (my emphasis on “whether” is key – read on). The EPA proposal was boldly titled: “Potential Addition of Vapor Intrusion Component to the Hazard Ranking Sytem” (emphasis on “potential“). The proposal went on to ask the public, “if” EPA should, then “how” EPA should do so. EPA, the supposed experts, provided no substantive details on how they thought vapor intrusion should be considered. EPA provided no timetable for final decision or any commitment to final rulemaking. EPA merely solicited public comment on a series of questions EPA posed, as if vapor intrusion was some deep unknown or new discovery. However, a closer look at the history and current bureaucratic process suggest a very different picture – specifically, that the proposal was snagged by Obama’s recent Executive Order and U-Turn on regulatory policy. Eligibility for Superfund cleanup is established by a risk screening method known as the EPA “Hazard Ranking System” (HRS) – the higher the score the worse the risks. Sites that score above 28.5 points qualify for Superfund. The current EPA HRS does NOT consider risks from vapor intrusion. (but NJ DEP has even worse flaws – DEP has no priority system in place). Such a long overdue move by EPA to fix this HRS flaw would qualify hundreds of more contaminated sites for the Superfund “National Priorities List” (NPL), including at least 20 more sites in NJ where toxic chemical vapors are poisoning people in homes, schools, and other buildings (see GAO Report below). This significant expansion in the Superfund program would cost polluters billions of dollars more in cleanup costs, and comes at a time when the Superfund pot of cleanup money is empty, and efforts to renew the funding are stalled by pro-industry Republicans in Congress (and opposed by Governors like NJ’s Chris Christie, who oppose regulation and demand that environmental agencies to “do less with less” ). So obviously, there has been – and currently is – fierce behind the scenes lobbying by polluters and anti-governmental zealots to block EPA from doing this. My sense is that EPA’s “Hazard Ranking System” proposal has, at best, been stalled or relegated to a regulatory purgatory. At worst, the proposal has already been derailed – killed behind the scenes – and amounts to a “dead proposal walking”. In the latter (and more likely) case, EPA’s Fed. Register Notice would merely be going through the bureaucratic motions to save face and avoid having to ID the corpse and suffer the political embarrasment of having to admit caving to chemical industry and Republican pressure. As we have written, the Vapor Intrusion (VI) phenomenon is nothing new. For example, EPA proposed VI guidance for toxic site cleanups almost 10 years ago, back in 2002. Since then, the number of toxic sites where EPA and State agencies are discovering chemical vapors seeping into buildings has expanded greatly, and so has the public outrage those belated discoveries create. But many of those VI sites are not currently eligible for Superfund because the HRS scoring method fails to consider VI exposures and risks. Thus, those sites were ignored. As a result, many people are being exposed to avoidable VI risks without their knowledge and with no program to fund cleanups. But despite knowledge by EPA of serious VI problems nationally, for years, EPA never moved to revise the HRS scoring method. Why do you think that is the case? Surely not because of lack of knowledge of these risks by EPA scientists and staff. In fact, the current proposal to expand the Superfund HRS did not originate within EPA. EPA regional officials estimated that from 101 to 125 sites – about 20 to 25 sites per year – will be added to the NPL over the next 5 years, which is higher than the average of about 16 sites per year listed for fiscal years 2005 to 2009. Most of the 10 states’ officials GAO interviewed also expect an increase in the number of sites listed from their states. However, neither EPA regional officials nor state officials were able to provide cost estimates for cleaning up many of the sites. In addition, the number of sites eligible for listing could increase if EPA decides to assess the relative risk of vapor intrusion – contaminated air that seeps into buildings from underground sources -a pathway of concern among EPA regional officials and state officials interviewed. Although sites with vapor intrusion can pose considerable human health risks, EPA’s “Hazard Ranking System” the mechanism used to identify sites that qualify for NPL listing does not recognize these risks; therefore, unless a site with vapor intrusion is listed on some other basis, EPA cannot clean up the site through its remedial program. To better identify potential NPL sites, GAO recommends that the EPA Administrator determine the extent to which EPA will consider vapor intrusion in listing NPL sites and its effect on the number of sites listed in the future. EPA didn’t initiate, they reacted, to address the negative GAO findings and implement the GAO HRS recommendation. Back in December, EPA released an ” Integrated Cleanup Initiative Draft Implementation Plan“, which was open for public comment through January 10, 2011. That EPA implementation plan called the VI HRS revision as an action item. The December Plan also suggested that EPA would soon engage in rulemaking to incorporate vapor intrusion risk into the Hazard Ranking System (HRS). One would assume that after years of experience with vapor intrusion at scores of sites, and following the public comment on the “action items” in the December implementation plan, EPA now would be in a position to propose a regulation – with specifics and meat on the bones – for public comment. But EPA did not propose a regulation. They proposed a public notice asking “whether” EPA should propose a regulation. Do a hollow Federal Register Notice that merely asks a set of questions and EPA plans to hold “listening sessions” constitute “action“? Not in my book. There is a huge difference between an actual regulatory proposal and a notice seeking comment on whether EPA should regulate. My guess is that EPA got strong political opposition, and is backing off, given the recent Obama Executive Order and U-turn in policy on regulations. And consider the chronology closely – the timing between the May GAO Report, the December Draft Plan, the January Obama EO, and last week’s proposal – that’s more evidence suggests bureacratic backtracking by EPA. To comprehensively explore, and if determined appropriate, identify approaches for adding the threat posed by contaminant vapor intrusion into occupied structures to the HRS, EPA is beginning the process of soliciting stakeholder input. To determine whether to move forward with this addition, and if so, to determine a range of potential approaches, EPA is soliciting input on the topics described below. Case closed – time will tell if EPA follows through on this. 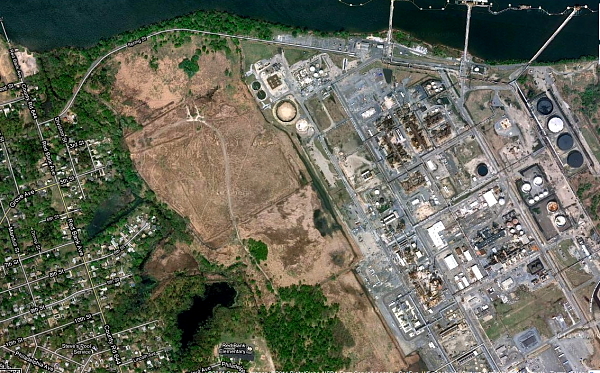 My advice to the folks fighting Dupont in Pompton lakes: Don’t hold your breath. I thought it might be interesting for readers to take a look at the Sunoco Coastal Eagle Refinery which was the subject of the DEP NRD Deal with new owner El Paso. The Settlement document lacks any factual findings that describe the specific NR damages (how convenient for El Paso!). It merely references various very old remedial investigations. So until I can file an OPRA and review the documents, we’ll speculate about the nature and scope of pollution impacts (DEP leaks welcome!). I do have some old RCRA documents that show a regulated old landfarm and lime slurry operations. The site is bordered by the Delaware River at the top (west) and dense (1/4 acre lot) residential neighborhoods on the left (south) and right (north). Let’s take a few closer looks – I’m no aerial map interpretation expert, but I’ve been to the site and will make notes. That’s Red Bank Elementary School at the bottom left. How’d you like to send you kids to that school? 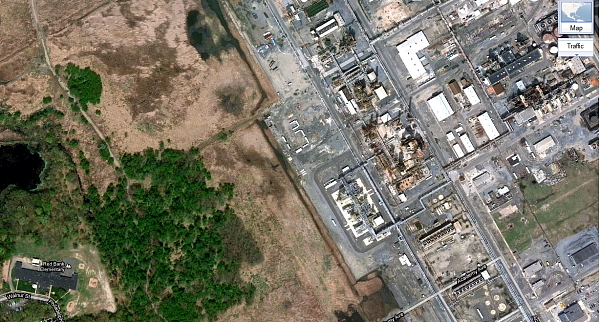 Surprisingly, the thin strip of land between the refinery and the school (300 feet?) was posted as “endangered species habitat”. What kind of critters liketo live amidst toxic discharges? Maybe Coooper’s Hawk has adapted to live there too, as well as in the suburbs! That looks like a pond – wonder if the fish are edible and how the other aquatic life are doing? Were these resources damaged by Sunoco and part of the NRD deal? Here’s what the school looks like from the ground – look closely directly above the dome of the school and see the looming refinery towers. Toxic air emissions are not good for children and other living things! On lower left, note the wetlands, and stream flowing from the pond to the river. Note the drainage ditch along the perimeter that also discharges to the river. 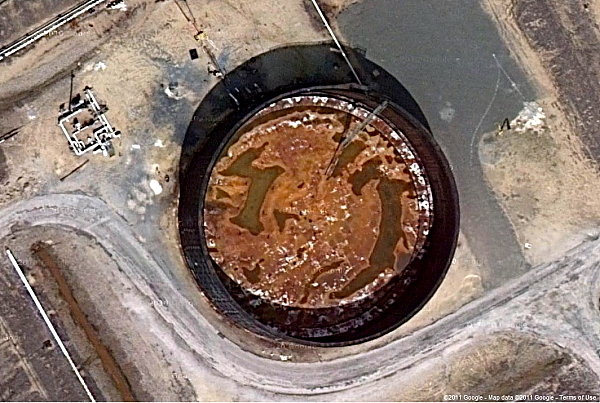 There may be old unlined surface impoundments and lagoons stored toxic liquid hazardous waste on site. These and hundreds of spills and leaks over decades of operation, have led to massive soil and groundwater pollution. I assume that this groundwater pollution and surface runoff from the site are polluting the Delaware and poisoning ecosystems. I wonder what the Baseline Ecological Evaluation and NR damage assessment concluded about all that? How much are those resources worth? Looks like there are some pretty valuable natural resources and sensitive receptors at the northern perimeter of the facility too. How’d you like to live in that neighborhood? That’s a Farm down there, but it sure don’t look like Old MacDonald’s Farm. Does it look well maintained? Gee, I wonder what kind of toxic crap is in this tank? But don’t worry, be happy. The business friendly Christie DEP’s is looking out for you and Bob Martin is treating his “customers” (Sunoco) right! (look at that logo! Wow! The Official Fuel of NASCAR! But that tank in the lefthand background doesn’t look too good). The issue – and the story here – is not whether removing dams is good for fish and water quality. If that were the case, then the Dupont NRD deal to plant trees and preserve land would have been given “rare praise” as well (instead of correctly condemned by Tittel and others as a “sweetheart deal”). The real issues are: 1) whether the public was adequately compensated by an oil company for hundreds of toxic spills and leaks over decades at a billion dollar profit producing refinery – and 2) whether the natural resources damaged by those toxic pollution discharges along the Delaware River have been restored. 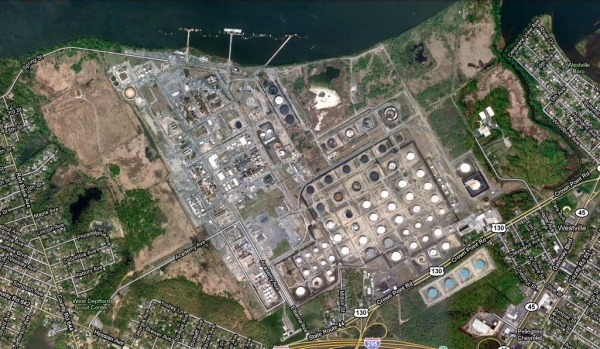 DEP issued a press release late today announcing a Natural Resource Damage (NRD) settlement agreement involving pollution from the Sunoco Coastal Eagle refinery in West Deptford (and 3 affiliated company facilities: EPEC Polymers Inc in Flemington; Nuodex Inc. in Woodbridge; EPEC Polymers Inc. in Burlington City). There have been hundreds of spills and discharges at the Coastal Eagle refinery over many years, leading to significant soil and groundwater pollution, off site contamination, and adverse water resource, fisheries, wildlife and ecological impacts. The deal is unusual and raises all sorts of red flags. First is timing: the NRD Settlement was published over 3 months ago in the NJ Register, on October 18, 2010. The opportunity for public comment expired in November – there was little public awareness and no public comment on the deal. So why is DEP issuing a press release now, after the public comment period is closed? Why didn’t DEP issue the release 3 months ago, when it mattered and the public could have used the information and meaningfully participated? The timing also suggests DEP is responding to last week’s bad press on air quality rules for refineries that have come under attack. The coverage of that story created the impression that Governor Christie’s “regulatory relief” policies were seriously flawed. Today’s DEP release puts out some good news on refineries, and creates the opposite appearance – let’s just agree to call it news management. Last, on the merits, the deal is totally arbitrary. This repeats a longstanding problem, as the NRD program has lacked transparent and enforceable standards. 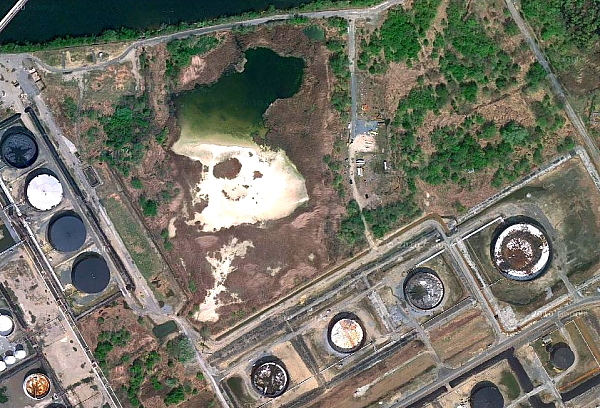 We are writing concerning the need for standards to assess and restore adverse ecological impacts resulting from the discharge of hazardous substances to the environment at more than 20,000 sites in New Jersey. Individually and cumulatively, these sites represent a major threat to sensitive ecosystems and natural resources, as well as public health. It is imperative that those impacts and ecological impairments be assessed, restored, and the public fully compensated for lost uses of important fish, wildlife and other natural resources resulting from the discharge of hazardous chemicals to the environment. The Sunoco deal is highly unusual and seriously departs from almost all prior settlements. That was a major controversial issue recently in the Dupont NRD deal, where Pompton Lakes residents got no benefits, despite suffering years of Dupont pollution. New Jersey courts and the business community have opposed such unprincipled and unbridled discretion to coerce NRD settlements, especially in the absence of promulgated DEP rules. Rules would provide up front guidelines, criteria, standards, and procedures for estimating the value of natural resources damaged and the parameters of settlement in the form of money compensation or restoration of equivalent natural resource functional values. 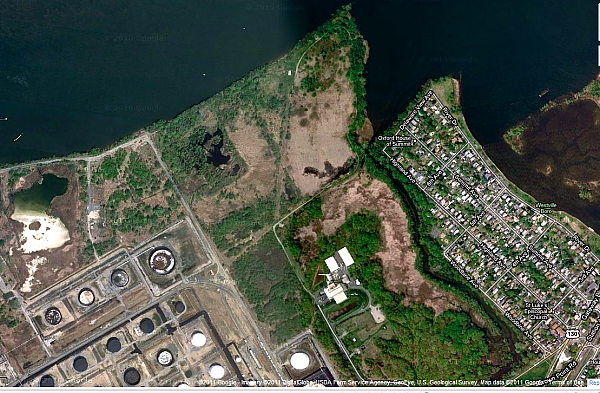 The Sunoco refinery deal provides for the removal of 3 small dams on the Raritan River. While I support dam removal, what does that have to do with toxic soil and water pollution along the Delaware? There is simply no nexus between pollution at a refinery on the Delaware river and dam removal on the Raritan river. Both the timing and the terms of the “Lets make a deal” nature of this NRD settlement are troubling. I don’t like to delve into the national scene, but sometimes the “I told you so” factorÂ is too sweet to resist. From the outset of theÂ Obama Administration, we have been highly skeptical and publicly critical of theÂ environmental policy agenda. That skepticism initially was based on selection of Lisa Jackson as EPA Administrator, a nice person, but long on rhetoric and short on delivery (and we never had high regard for recycled Clintonite, CarolÂ Browner. But we have high regard for EPA Region 2 Administrator Judy Enck). Our concernsÂ haveÂ been confirmed repeatedly by EPA’s actions since then. As you know, PEER opposed your confirmation as EPA Administrator based upon your record as Commissioner of the New Jersey Department of Environmental Protection (DEP). One of our principalÂ concerns was that you repeatedly did not follow through on promises you made for action at DEP, leaving a trail of unfulfilled rhetorical commitments. We see a repetition of this same pattern durign your tenure at EPA. So the fact that Obama’s “ambitious goals” Â have achieved – at best – what the New York Times today characterizedÂ as “modest policy gains“Â – and that the Administration isÂ now backtracking on the environment, comes as no surpriseÂ to us, nor should it toÂ anyoneÂ else who is paying attention. And the NY Times apparently is not aware that almost all of the promised regulations that support their claim ofÂ “modest policy gains”Â remainÂ just promises and have not been finalized and formally adopted.Â So there is still lots of backtracking to be done before 2012. In a larger sense, today’s story about the departure of Carol Browner – White House “Energy Czar” – was no surprise. It was preceded by several obvious signals of retreat, not the least of which was the collapse of cap and trade (which we viewed as a good thing,Â but done for the wrong reasons). Just last week,Â Obama issuedÂ an Executive Order on Regulatory Review, which parroted right wing talking points about regulation. Growing more republican every day, last Thursday, the New York Times reported that the Obama EPA was walking away from major regulations, just at the critical moment when EPA needed to ramp up regulations to address global warming in light of Republican intransigence and global warming denialÂ in Congress. We startedÂ in the wake of Obamaâ€™s disasterÂ at the global warming treaty collapse at Copenhagen; with deep disappointment with Congressional Democratsâ€™ inabilityÂ to enact real reforms despite huge majorities in both Houses;Â and under a dark cloudÂ cast byÂ the election ofÂ NJ Governor Chris Christie. This rulemaking is necessary because without it PSD and title V requirements would apply, as of January 2, 2011, at the 100 or 250 tons per year (tpy) levels provided under the CAA, greatly increasing the number of required permits, imposing undue costs on small sources, overhelming the resources of permitting authorities, and severely impairing the functioning of the programs. EPA is relieving these resource burdens by phasing in the applicability of these programs to GHG sources, starting with the larget GHG emitters. EPA subsequently followed up on the “tailoring approach” with anÂ empty – literally, in this caseÂ content-less – press conference announcement of a settlement agreement to propose regulations in theÂ future that would apply to refineriesÂ and power plants. It has not been reported that theÂ EPA Settlement is a weak deal. Fine print of the settlement agreement allows EPA to violate the deadlines for regulationsÂ with virtual impunity. The settlement provides little enforcement leverage for environmentalistsÂ – see remedies in paragraphÂ #7 . The regulatory deadlines in the settlement give EPA another big out – thay areÂ conditioned upon the availability of approriations and thus may be killed by Republicans in Congress who have said they will not fundÂ global warming regulationsÂ (see paragraph #12). The Bush EPA rejected the Section 108 NAAQS approach asÂ too costly and politically infeasible. So did Obama and Lisa Jackson. Same as Bush â€“ this is notÂ change we can believe in. We don’t have the time or energy to conduct a full blown 2 year review of the Obama/Jackson record. Just goes to show, you gotta watch what they do, not what they say. Obama is dominated by corporate interests. And, as we predicted-Â just like in NJ, where she caved to Governor Corzine’s political whims -Â Lisa Jackson lacks the independence and spine to stand up and fight. Last Thursday,Â the Assembly Regulatory Oversight Committee Â released a resolution (ACR 132) that found a DEP clean air regulation “inconsistent with legislative intent”, the first step of repealing the rule. Bill Wolfe, director of the New Jersey chapter of the Public Employees for Environmental Responsibility, defended the rule, saying the federal Clean Air Act contemplated a strong role for states to define control measures that were state-specific. 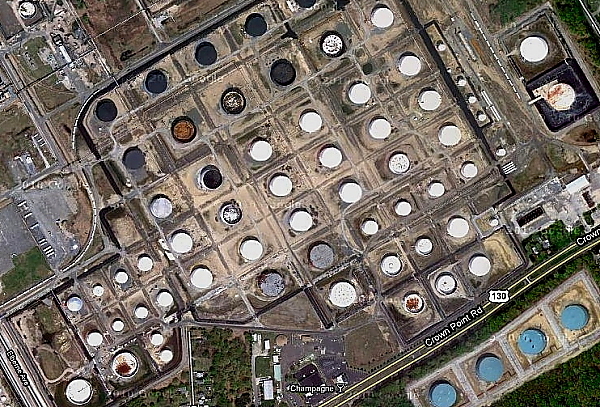 Bill Wolfe, an environmental advocate and former DEP employee, called the oil-tank provision “a pure public health-protection measure” and said New Jersey had to take extraordinary measures to start meeting air-quality standards. He said that the industry previously would not have been bold enough to argue against it but that Gov. Christie had created a regulatory climate inviting such challenges. One of Christie’s first acts in office last year was issuing an executive order saying that state agencies shall not adopt rules that exceed federal requirements, with limited exceptions. He also commissioned a group to identify regulations that impede economic development for reasons that include exceeding federal standards “without well-documented cause,” placing the state at a competitive disadvantage in attracting jobs. It is obvious that the oil industry isÂ cynically tryingÂ to capitalize on the current economic recession and Governor Christie’s regulatory relief policies to roll back a 2009Â DEP regulation on gasoline storage tanks. The rule was proposed backÂ in 2008 and has been on the books for almostÂ 3 years.Â The legislature had ample opportunity to raise objections during the 2008 public comment period but failed to do so. Obviously, the only relevant thing that’s changed since then is Governor Christie’s “regulatory relief”Â policy agenda, which has invited oil industry lobbyist to mount aÂ legislative attack. DEP bent over backwards and gave the oilÂ industry until 2020 – 10 years -Â to comply with the requirements to control volatile organic compound (VOC) emissions from their storage tanks, primarily located at refineries. DEPÂ estimates that the rule will reduce current VOC emissions from gasoline tanks by 130 tons per year. DEP estimates that these requirements will apply to about 70 tanks and cost $58 million.Â If that cost wereÂ fully passed through to consumers, the impactÂ would be less thanÂ one penny per gallon of gas at the pump. Obviously, that $58 million wouldn’t put a dent in the industry’s rising multi-billion profits. But, strategically, this DEP gas storage tank rule is chump change -Â Â there areÂ far larger issuesÂ in the pipeline. RefineriesÂ willÂ be required to reduce emissions even further to meet new EPA ozone standards (EPA proposed to reduceÂ the currentÂ 75 ppb ozone standard to a range of 60 – 70 ppb in theÂ January 19, 2010 Federal Register). The oil industry is using this gas tank rule to draw a line in the sand and frame the debateÂ onÂ larger upcoming issues. As usual, they rely on the Big Lie about environmental requirements and the economy Â (the current slogan is “job killing“). For example, ACR 132 sponsor Burzichelli used that Big Lie in the Inquirer story, where he falsely claimed that the recent closure of the Sunoco refinery in West Deptford was related to environmental complianceÂ costs. But, in reality, that refinery closed due to slack or declining demand for gas as a result of the recession. If the business communityÂ can back DEP off these current requirements, they build power to deter future requirements. Here’s how the oil industry is seeking to back DEP off. This vetoÂ power has been used very rarely. Instead, legislative oversight hearings are typically is usedÂ more as a political threat in order toÂ extract concessions. Oil Industry lobbyist testimony repeatedly cited Governor Christie’s regulatoryÂ relief policies (cost benefit analysis and a policy not to be more stringent thanÂ federal minimums) and theÂ Red Tape Report recommendations to promoteÂ flexibility. The icing on the cake that makes this game possible? Costs are also considered on a unit specific basis if costs are shown in an Alternative VOC control plan submitted pursuant to N.J.A.C. 7:27-16.17 to be economically infeasible because of unusual site specific circumstances which result in extreme costs. In this case, the DEP rule in question requires that gasoline storage tanks install vapor controls to reduce emissions of volatile organic compounds (VOCs), including hazardous air pollutants like benzene, aÂ known carcinogen. VOCs are ozone precursors and contribute to unhealthy air quality commonly referred to as smog, or in regulatory jargon, exceedence of the NAAQS for ground level ozone. NJ does not meet the current ozone standard and must sharply reduce current emissions. In setting primary ambient air quality standards, EPAâ€™s responsibility under the law is to establish standards that protect public health. The Clean Air Act (â€œActâ€) requires EPA, for each criteria pollutant, to set a standard that protects public health with â€œan adequate margin of safety.â€ As interpreted by the Agency and the courts, the Act requires EPA to base this decision on health considerations only; economic factors cannot be considered. The prohibition against the consideration of cost in the setting of the primary air quality standards, however, does not mean that costs, benefits or other economic considerations are unimportant or should be ignored. The Agency believes that consideration of costs and benefits is an essential decision making tool for the efficient implementation of these standards. Â The impacts of cost, benefits, and efficiency are considered by the States when they make decisions regarding what timelines, strategies, and policies make the most sense. New Jersey’s comprehensive set of strategies to meet the NAAQS for ozone are found in the EPA approved State Implementation Plan (SIP).